: Crisp white tablecloths, an open kitchen (behind glass) and a bustling happy hour featuring fifty-cent oysters and half-price drinks make Luke a downtown social hub. 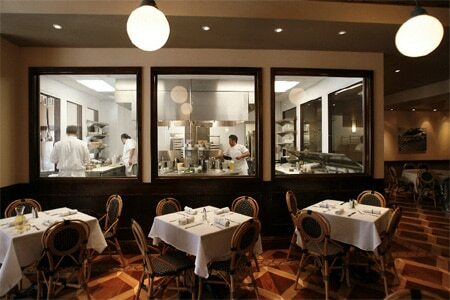 Chef John Besh embraces the more casual delights of French, Creole and German brasserie fare. For breakfast, there’s Louisiana crab omelets, pancakes with honey-pecan butter and Benton’s bacon from Tennessee, classic New Orleans grits and grillades (strips of veal over stone-ground grits), and stuffed shrimp and Gulf fish meunière. The popular weekly Friday night dinner special is a traditional court bouillon, with Louisiana redfish, crab, shrimp and oysters over rice. The massive Luke burger of local Charolais beef is legendary. Besh’s imaginative culinary spirit endures until the very end of the meal; his bread pudding is served with vanilla bean ice cream and hot buttered pecan sauce. The wine list features mostly French wines, leaving a surprising absence of German options (look for some hard-to-find German beers on the beer list). Moderately priced, the list is not extensive, but two dozen rotating by-the-glass selections are offered.